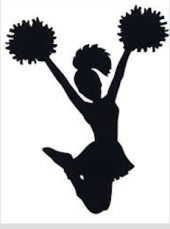 Cheer Tryouts for Football Season, grades 6, 7, 8, 9, 10, 11 (this year) and tryouts for “The Chieftain” mascot, juniors only (senior next year), will be held on May 28th, 29th, 30th. 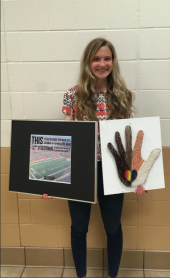 The LHS Art Department would like to congratulate Grace Mullett, LHS Junior, for being a finalist in two regional art contests this year. Chieftain Center Expected to be Completed in June! 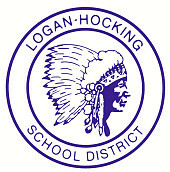 Press Release Logan Daily News Frequently Asked Questions By the end of June, 2019 the Logan High School Shaw-Davidson Campus will have a completed 86,000 square foot addition. The Chieftain Center is on schedule to have its grand opening in a matter of weeks, proving partnerships between school and community can have tremendous results. On Wednesday, April 17th, at 10:00am, a surprise check presentation was held at Logan-Hocking Middle School Staff Lounge, where administrators and co-workers -two who also happen to be the recipient’s parents, gathered to see six grade teacher, Jonathan Huntsberger’s, reaction when Sharlie Trentman, of California Casualty Management Company, presented him with a $1,000 check. 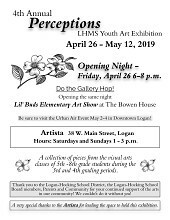 The Logan Hocking Middle School Visual Arts Instructors would like to invite you to visit the 4th Annual Perceptions Art Exhibition opening Friday, April 26th from 6:00 p.m. until 8:00 p.m. The show will be held at Artista, located at 38 W. Main Street, in downtown Logan. Light refreshments will be served. 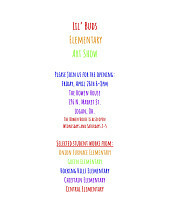 Make it a Gallery Hop and stop down to The Bowen House to see the Lil’ Buds Elementary Art Show the same night! 2019 Prom - Unlike Any in LHS History! A stand out event for most juniors and seniors is the high school prom, historically held in school cafeterias or banquet halls. According to Lori Holmes, Junior and Senior Class Co-advisor, the Logan High School students are in for a surprise, which will make this year's prom unlike any other in recent history. 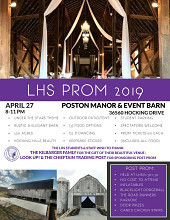 The 2019 LHS Prom will be held on Saturday, April 27, 2019, from 8:00-11:00 p.m. What makes this year unique is the location. LOGAN-HOCKING SCHOOLS KINDERGARTEN REGISTRATION REMINDER Lauren Lupo and Charlie Hunter are excited that they both have completed the screening to attend Kindergarten next year. The girls are cousins and will both attend Central Elementary. Registration for children who will be attending kindergarten during the 2019-2020 school year is being done thru May 13, 2019. Bainter Wins Shot Put at Heath Invitational! 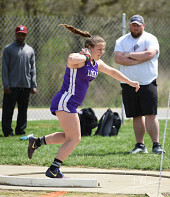 At the Heath Invitational meet, Lanie Bainter won the shot put, by tying her personal record, with 39 feet, 10 inches. Congratulations, Lanie! Many others placed very well and/or set new personal records. Read details here: Logan Daily News Press Release Thank you to the Logan Daily News for doing a wonderful job of featuring our athletes!